Buffalo Rock operates one production facility. This production facility is located in Birmingham, AL at 111 Oxmoor Road and produces over 40 million cases of product annually with the capacity to produce in excess of 55 to 60 million cases annually. This plant is operated by 260 employee-partners. 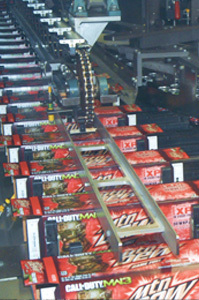 The Birmingham facility holds eight production lines – three cans, four PET and one bag-in-a-box. Buffalo Rock bottles its own brands, including Buffalo Rock Ginger Ale, Grapico, Dr. Wham and Sun Fresh Brands, as well as Cadbury Schweppes and PepsiCo carbonated products at this facility. It produces about 90% of the products it distributes. The Birmingham building has expanded during the past 40 years, and the company added its newest line in 2003. 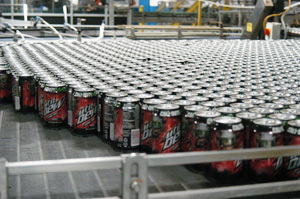 Buffalo Rock’s three can lines fill at a rate of 1,200 cans per minute. 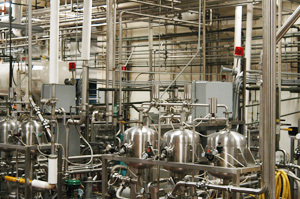 In its PET lines, the company utilizes: one 2-liter line that fills 180 bottles per minute; one 2-liter/20 ounce line that fills 2-liters at 100 bottler per minute and 20-ounce bottles at 250 per minute; one 20-ounce PET line that fills at 800 bottles per minute; and a multi-purpose line that fills 12-ounce, 20-ounce, ½ liter and 24-ounce packages and runs at an average rate of 500 bottles per minute. The production facility runs a continuous operation working 24 hours, 7 days a week, on a 12-hour shift basis. Each of our 14 distribution centers provides a forecast, which dictates the production schedule and a loading schedule for the loading dock. From the forecasts, tickets are generated to tell the crew how many pallets of each product a load needs, and loads are picked accordingly. Our company’s goal of constant improvement is embraced by our Logistics department, which includes manufacturing, operations and facilities. The Birmingham site was rewarded by receiving the 2006 Alabama Quality Award for Buffalo Rock’s Progress Toward Excellence.